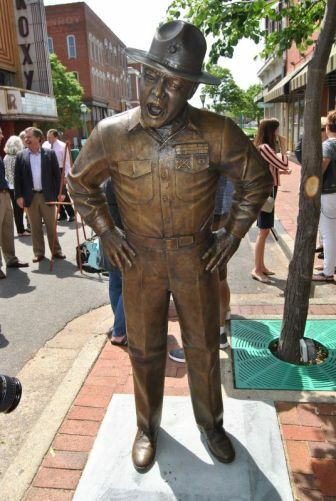 “`A statue of actor Frank Sutton was dedicated in Downtown, Clarksville, TN. He’s best known for playing Sgt. Carter on Gomer Pyle U.S.M.C. The City of Clarksville prepared the site and installed the work. “`A crowd of over 150 people — including a group of third-grade students of Clarksville Academy, and sponsors from Coldwell Banker Realtors — gathered at the event, to watch Mayor Kim McMillan, project leader Mark Holleman, and sculptor Scott Wise pull the shroud from the bronze image. “`The statue of Sutton emerged glowing in the midday sun, and it evoked a nice reaction from the crowd. Wise’s statue perfectly evokes Sutton’s stance of Sgt. Carter from the CBS sitcom, with his trademark hat, square jaw, and flaring nostrils. “`Sutton took to the stage as a student at East High School in Nashville, where his family moved when he was eight, and then, he returned to Clarksville after high school. He toiled as a radio broadcaster. During World War II, Sutton enlisted in the United States Army, and served in the South Pacific. After the war, he began a notable career as an actor, with a number of television roles. Frank Sutton died in 1974. “`No word if Jim Nabors attended the unveiling. This entry was posted on Saturday, June 3rd, 2017 at 12:19 pm	and is filed under Blog by Manny Pacheco. You can follow any comments to this post through the RSS 2.0 feed. Responses are currently closed, but you can trackback from your own site.